Mouth injuries are common for toddlers learning to walk and maintain balance. A fall can drive new teeth into the tongue and form a laceration. 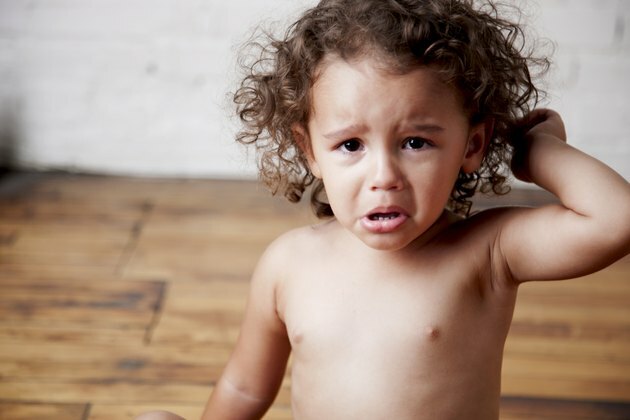 First aid is the same for children as it is for adults, but it's more difficult with a crying toddler. The goals are to control bleeding, reduce swelling and prevent infection. Deep cuts or broken teeth will need to be seen by a doctor prevent complications. Cover the cut with a wet, cold towel. Apply pressure to stanch the bleeding. Wash the laceration with clean water after the child calms down. Tilt the baby's head forward and pour cold water over the area to rinse off the blood. Wrap a few ice cubes in a clean cloth and hold it over the tongue. This will reduce swelling and pain. Examine the toddler's mouth. Look for broken teeth or anything that may be stuck in the tongue. If necessary, remove any foreign object with a pair of tweezers. If the laceration is 1/2 inch or more long or continues bleeding, take the baby to the doctor or hospital. The cut may require stitches. If the cut is deep or if part of the tongue is torn away, go to the hospital or call 911 for emergency assistance. Watch the tongue as it heals for signs of infection. Contact your pediatrician if the area swells, begins to drain or if the baby runs a fever. Keep the toddler's head tilted forward to prevent aspiration of blood. Use caution; an upset child may bite down when you touch the laceration.